February 1st, lets see, Joe has a birthday on the 15th. He will be the same age as as me until October. I am from October to February older than Joe, but a few months out of the year I can say we are the same age. Okay, if you wondering, I was born in 1953, and Joe 1954. So now you know how young I am. Praise God, for every year. Joe and I married on June 18, 1977, so you can say we have gotten used to each other by now. Ha Ha I was reading back over a devotion that I did in 2002. Since then I have gone through nine surgeries. Praise God, that I am here tonight, getting a chance to do e-mail devotions. Yes, it has been a hard and difficult time, but God has always been there to do His work in me. I have learned to trust in God with even a deeper meaning in my life. I have learn to fly in a different direction and have had a chance to grow in maturity and increase my faith and my abilities. 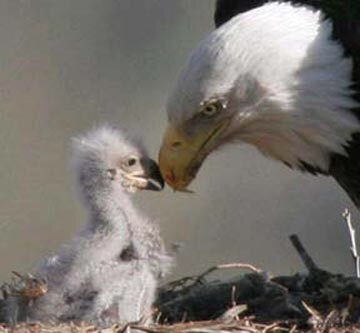 When the eaglet is allowed to struggle for purpose, He does not struggle just so he will trust the mother. He struggles to learn to fly. God’s allowing us to struggle is for a purpose, as well, to bring about maturity, to enhance our testimony, and to increase our abilities. Any time you think life is unfair, look at the cross. It wasn’t fair for the perfect Son of God to be nailed at the age of thirty-three. It wasn’t fair for him to suffer pain, ridicule, guilt, loneliness and death. It seemed on that dark day the world had turned upside down, and God’s people were falling into despair. But three days later, Jesus Christ arose from the grave to live in triumph. He has promised, if we walk in faith, he will do the same for us. That’s the reason we can walk and not faint. That’s the reason we can smile even through tears. We know there will come a day when we shall rise up again with eagles… and fly! So remember, when you are at your lowest, weakest moment, that may be the time God uses you to make the greatest impact. Like the eagle, when you are falling, this may be when you are about to learn to fly.